Protect your online privacy with Speedify VPN services – 100% secure, reliable and safe tool. Test the trial version before you buy. Read the full review for more details. Overall Speedify VPN is an excellent tool and solves all your internet issues. You can download and check full services in the trial version. Plan for starters, individuals, and teams. Have you ever sat at the airport and thought what if by my magic I get both the speed of Wi-Fi and my data connection? Well, Speedify has made your dreams come true. A virtual private network is a way which creates the connection (encrypted and safe) and allows users to send and receive data in their devices as if the computers were connected to its private network. The VPN connection method is used to add security to the networks. VPN hides all your action just like incognito window and routes your connection through the server. When someone uses a VPN service, all the data is going to be encrypted which will flow to the VPN server through ISP. The VPN server will act as a mediator to connect to the web through your computing device. Your device is hidden and the VPN server is shown as the origin of traffic. Your computer won’t be identified as the main source of data and your activity won’t be tracked. A proxy server is the one which acts as a mediator for a different request from the clients who seek resources from other servers. The proxy allows users to have indirect network connections with other network services. Proxy lists have IP addresses which host open proxy servers, available to people who have good internet access. Speedify boosts up the speed of the internet by bonding two different connections. Speedify offers servers in more than 26 countries right now and is always working to expand more. Speedify promotes free and a well-organized internet with no limit over your monthly downloads. One can use Speedify in 2 devices with one login. While using Speedify, one gets a virtual IP address. It allows P2P traffic in servers, but only in the Netherlands. 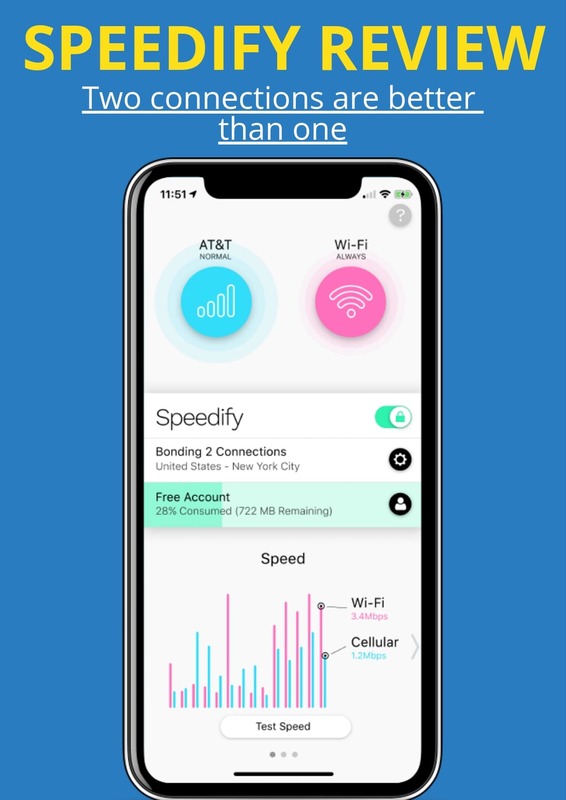 If you have a good bandwidth connection and a network access Speedify will also a server in your facility. VPNs today affect the speed of internet speed. Lots of data is cut and download or streaming is clogged. Speedify solves issues like this by combining the connections. The encryption protocols see to the online safety and maintain your anonymous status while the speed boosts up because all your tasks are spread into different networks. There is no lagging problem when using Speedify. One thing to ensure is that you should use the connection from other different resources such through Speedifyable. When Ethernet and Wi-Fi networks are connected together in the same router, it won’t be able to combine for an increase in bandwidth. This is due to a shared upstream network. If your computing device has only one card for Wi-Fi, you will have to buy an addition USB adaptor to connect to the secondary network. If one uses a “naked” Wi-Fi the speed drops gradually. But once you use Speedify without encryption the drip is much lower. When you add another secondary link things get much better. So yes one can say Speedify fulfills its promises. The overall loss incurred by connection is reduced and the speed is eventually raised. The bonding goes on without any interruption and joins two networks together to provide a good speed and heavier downloads can be processed. Speedify performs best in terms of security and privacy. It keeps its promise of not storing or logging any sites we visit through the Speedify services. The company does as it promises, it will never log your IP addresses in their service, or any data which is sent or received. The logging of the session is limited to its connection time and the whole session length. No registration is required if you are going to use the free service. So no worry is needed. If you face any issue while using the services of Speedify, the company is ready to help you anytime in need. Speedify uses Google Analytics and many other services to send you promotional details, but if you want you can unsubscribe at any time. Anyone who uses Speedify is impressed by its policies, clear clarities, and other details. The company uses ChaCha cipher to deliver the expected performance for its VPN services. As mentioned above, Speedify can run smoother if one turns off its encryption. For Windows users, Speedify enables the super secure mode prevention Windows from sending DNS request on any other connections. Does Speedify burns your pocket? Speedify offers its unlimited service for only $63, or $19 per month. It’s an unbelievable price for anyone who would love this bonding of two connections. The price is actually pretty good for those who don’t want to upgrade for another service provider but would love the bond created by Speedify. Many service providers would cost you more. Even many VPN would cost you even more. If anyone does not need unlimited service and would be okay with 50GB of data per month then it’s only and only $30 per year or if you want to try for a month first, then its $9 a month for a good Speedify use. Speedify is a very clean and an easy to use service. The main principle followed is “cloud” and has a user-friendly interface. It has a very strong security. Speedify is a solution to combine your various connections and prevent any pause in the download. There are 1000+ servers and all are dedicated. It is a pretty good and reliable service with the channel bonding feature. Most of the users are satisfied with the servers it provides in most of the countries. Many tests have been conducted by various websites and they all loved it. The company has created their own VPN protocols and the Tor Browser works. It is extremely simple to use and the kill switch is present for an extra layer of protection for the users.